Lace-up the Nike Reax 5 when you want to run like the wind! These are quality light weight shoes that are very comfortable. These shoes have slight wear from being gently used, but they are great shoes in great condition. Very nice shoes. DO OUR BEST TO RESOLVE ANY PROBLEMS. No box, there may be minor scuffs, scratches. Women's Nike Reax Shoes Sneakers Size 8.5 Training White Gray Preowned. Condition is Pre-owned. Shipped with USPS Priority Mail. There are some wear on them, especially on soles. Please see pictures. Color: Black, Pink and Silver. Occasion: Running, Training, Athletic. Materials: Man Made. Soles - Have Heavy Wear. Uppers - Have Scratches and Light Wear. Linings - Have Heavy Wear. 1" shock resistant wedge. Dark pink and white waffle cut bottom soles, normal tread wear. Black fabric and synthetic leather with black laces, fabric lining and insole Gray and pink trim. They have been machine washed and air dried. Shipping available to the United States and worldwide through the global shipping program! Payment expected within two days of purchase please! Thank you for viewing my listing! Don't like them?. Send them back! 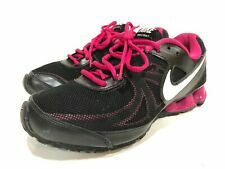 These silver, green, and pink running shoes are by Nike in size 8.5M. Removable insoles=no. Go for a run. These shoes are in very good pre-owned condition. Cushioned insoles. Shoes go from gold to white maybe discolored still cool shoes. Don't like them?. Send them back! 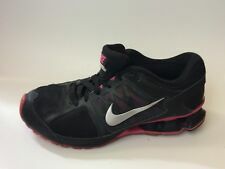 These black and green running shoes are by Nike in size 8.5M. Removable insoles=yes. Pump up your run. These shoes are in very good pre-owned condition. Removable insoles. A great deal! Super comfortable & stylish! A great sneaker! Color: Black, Pink and Silver. Occasion: Running, Training, Athletic, Casual wear. Materials: Man Made. --Very good pre-owned condition --No rips tears or holes --Normal minor cosmetic wear/scuffs from light use --Sz 8.5 --Clean interior and exterior --Excellent tread --Very well taken care of If you have any other questions please feel free to ask. Thank you!